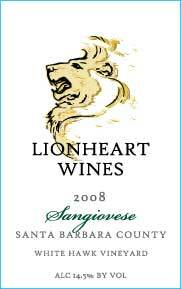 2008 Sangiovese, White Hawk Vineyard, Santa Barbara County If you love Tuscan foods and wine, then you must try this Sangiovese! We love Pinot Noir as it a highly versatile food wine! The best Pinot Noir is made from a blend of many clones to get layered complexity in the wine. We cofermented clones 115 with 828 and 667 with 777 from two vineyards to give balanced blending components resulting in a wine with excellent fruit, tannins and acidity. The wine was aged in 33% new French oak for 14 months. 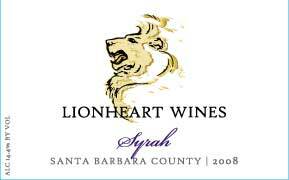 Serving this wine with sage rubbed turkey, duck burgers, and roasted herb squab. It is ready to drink now but we recommend 12 months in bottle before opening and will develop with bottle age for the next 5 to 7 years. This wine shows that California can grow excellent Sangiovese! It is a deep ruby/purple with pronounced aromas of raspberry, jam, bubblegum and cherry (red, dark and sour). The palate shows medium tannins, long length, high acidity and flavors of raspberry, brambleberry, strawberry, rhubarb and sour cherry. It is an excellent wine best served with tomato-based Italian pasta dishes, wild boar and BBQ chicken.